As you might guess from the title of this week’s episode, the Agents of SHIELD are thundering their way toward the end of the season, and it looks like the next few episodes are going to be all-out, SHIELD on SHIELD war. I’m not sure at this point who is on who’s side, but I’m hoping it’s going to be a fun race to the finish. This week’s episode began with a reintroduction to Agents Garrett and Triplett, and an immediate appearance by Deathlok, in which we get to see just how much he can take.Garret and Triplett pepper him with tasers, icers, and bullets and the cyborg is still able to beat a hasty retreat while the agents fall back to regroup. Next thing we know, all of the guest SHIELD agents from the season are getting back on the bus: Victoria Hand, Agent Blake, Garrett and Triplett, and even Agent Sitwell. The plan is to use them all to hunt down The Clairvoyant. But first, they use all of their considerable powers to make Skye a for-real agent, with a badge and everything. They then mine the SHIELD rejected people-with-powers list to find possible candidates for The Clairvoyant, and off we go. This is the part where I really started to notice that the other SHIELD agents may not be trustworthy. 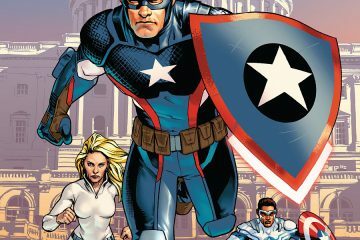 Garrett seems too cooperative, Victoria is too combative, Sitwell actually has to go on another mission (possibly Captain America related), and Blake is just the kind of guy who seems shady. However, as the episode continues, we get some better ideas about who is really who. The agents split into teams to investigate candidates for their big-bad, which lasts for about a minute before they are attacked. May and Blake get the bums rush from Deathlok, and Blake turns out the worse for wear for the encounter. However, it gives the agents a means by which to track Mr. Roboto, so they take off after him. He leads them to a man who they believe is The Clairvoyant, who gets most of the way though a pretty great super villain monologue before Agent Ward puts a bullet in him. 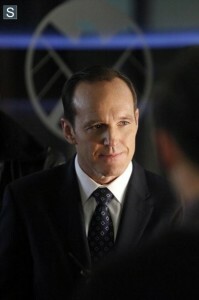 With Ward in hot water, Coulson is starting to feel like his world is closing in on him. That is, until he finds out that May has her own encrypted communication line on the plane, at which point he goes full-on PTSD. The episode ends with the notion that the reason why The Clairvoyant seems psychic is not because he/she is actually psychic, but because he/she has super high-level clearance within SHIELD. And based on the preview for next week, it looks like the organization is going to war with itself, and we’ll see soon where the lines are drawn. 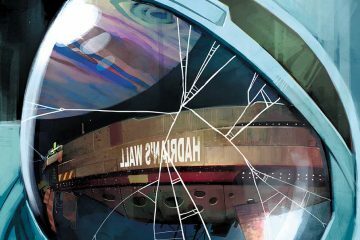 The End of the Beginning felt like the first issue in a new comic book story arc: it was a little choppy, a little all-over-the-place, but it set up what looks to be a really cool story for the last part of the season. I’m just hoping that we can continue to the end without any more ridiculous 2-week breaks. That being said, I also noticed that on first viewing, the story seemed kind of sloppy. As I watched, certain parts of certain scenes felt like they had holes. However, then that same problem would be brought up in dialog maybe half-an-hour later, so that those things that seemed like plot holes were actually plot points. I think the episode will definitely play better a second time, which makes me happy that I live in the age of Hulu and On-Demand. Deathlok looks pretty damn cool. There is a moment where Skye is looking at him through a monitor attached to an x-ray/thermal camera, and he looks almost exactly like the Deathlok from the comics. The Ward and Skye sexual tension is reaching a fever pitch. Something’s going to have to break soon. There is a moment when May tells Coulson that “Fury is back.” I’m sure now that his disappearance, which was mentioned several weeks ago in a SHIELD episode, and now return are direct references to happenings in Captain America: The Winter Soldier. Which is just cool. The preview that we got from Winter Soldier was really awesome: very Fury heavy. Friday can’t come fast enough. Watch it. Like I said, this is the beginning of the end, while also being The End of the Beginning. There were some rocky moments in the episode, but as the first issue in an arc, it plays pretty well. If you’re looking for a jumping on point before the finale, this is it. There are going to be some serious twists and turns before it’s all said and done, so catch it now and ride it out to the end.